The new, improved Hyundai Creta is not a full generation upgrade over its predecessor, but like every good mid-life upgrades, improves subtly over an already-established car. You’ve certainly noticed the largely increased numbers of SUVs going around you, no matter where you go. The entire world, with India among the leaders, have gone SUV-crazy for a while now, and while that may not bode well for sedan-lovers like me, there is no denying the prospect of value, utility and sensibility that these cars flaunt. Hyundai probably read between the lines when it first introduced the Creta in India, aiming to strike a balance between the butch-like form of SUVs and the car-like elegant driveability of sedans. Quite some time down the line, the Hyundai Creta has been a solid success for India’s second-largest car company. Despite stiff competition, the Hyundai Creta has held its ground. 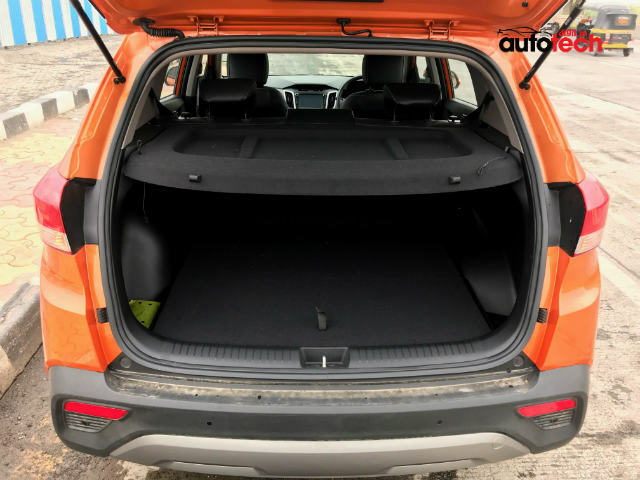 That itself is no mean feat - the Creta has had to deal with the compact Ford EcoSport, the burly eight-seater Tata Hexa, and a stunning surprise package in the Jeep Compass. The segment itself is quite vast, being among one of the highest selling in India after the ultra-affordable compact hatchbacks. Naturally, expectations were quite high when the 2018 Hyundai Creta was unveiled. On the face of it, there are not too many changes - the front grille has been upgraded, the new skid plates add a touch of durability, and has the Swachh Can inside - an in-car dustbin that the Korean car giant very notably flew brand ambassador Shah Rukh Khan in to unveil at the 2018 Auto Expo. While it does tidy things up a bit (excuse the pun), how do all these changes reflect with the car itself? A broader front grille that adds more road presence to the Creta, and adds more credibility to the Creta’s SUV moniker. The edges have broader chrome trims, the slats are slimmer, and the cascading hexagonal design is more prominent and taller. The front bumper has been redesigned, with bigger and more fluent creases around the front fog lamps, and shows smoother integration with the front grille to give a more visually appealing front facade. The shape of both the front headlamps and the fog lamps have been slightly altered. This had led to a headlamp cluster that is integrated with the chrome of the front grille. It doesn’t create a whole world of difference to be honest, but looks smart anyway. The sides are exactly the same, but now features the new, 17-inch machine-cut alloy wheels. The only two changes to the rear are the slightly taut rear bumper with a more prominent skid plate, and the new design on the tail lamps. The overall arrangement of the LEDs have been altered. There’s nothing good or bad here - just a new design to keep things fresh. It isn’t a largely prominent change either, so doesn’t exactly make that big a difference. Inside, the list of new features strewn across multiple variants include the sunroof (most prominently), the Hyundai Swachh Can (which actually is more useful than it may get credit for), cruise control, six-way power-adjustable driver seat, day-night adaptive IRVM, an integrated wireless smartphone charger and Hyundai’s new Smart Key Band. More on this band later. 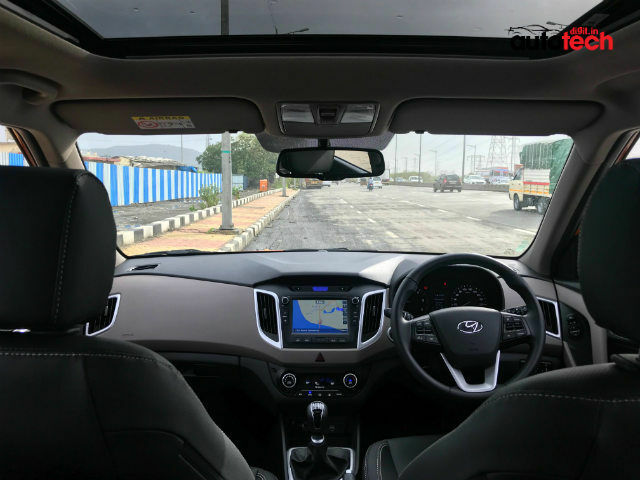 Beginning the Hyundai Creta’s technology package is the 8-inch touchscreen infotainment system running on Hyundai’s proprietary infotainment firmware. As always, the system is fairly smooth, although many may feel that Hyundai could have added a bit more of a premium touch to it. After all, there’s a sizeable difference of Rs. 2 lac between the Creta and the mid-size sedan, Verna. That, though, isn’t reason for penalising since that added cost accounts for completely different classes of cars. 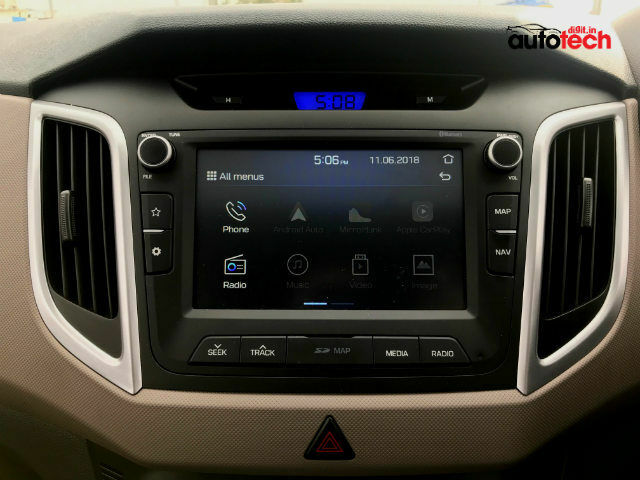 The infotainment system offers integrated navigation with voice read-out, Apple CarPlay, Android Auto and Arkamys sound modes to improve the performance of the default speakers. 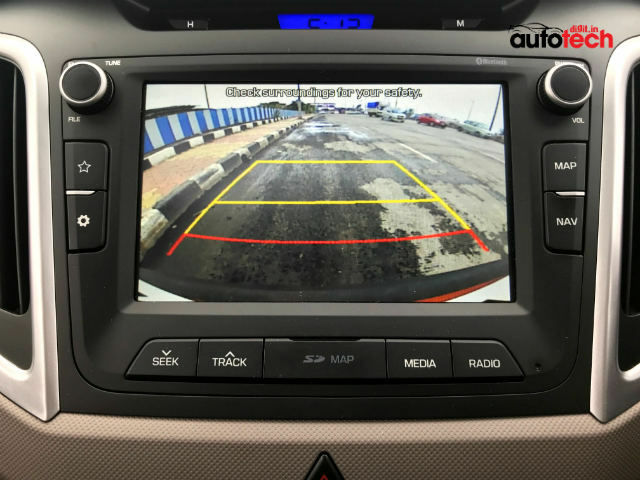 The firmware is the same as we have seen in every Hyundai car, and the list of features is exactly the same as what Hyundai provides in the Elantra and the new Verna. Using the system is fairly easy, with clearly marked features. Touch response is fairly fluid, although swiping around the map shows a slight amount of stutters. The display also supports splitscreen mode, which allows you to see the map and still have access to music controls at the same time. The colour scheme is not the most interesting, though, seeing how the likes of Jeep and Honda equip their cars with more interesting infotainment firmware. It is functional, but not the most engaging per se. That said, the native system itself is more than good enough for every function, and that reduces Android Auto and Apple CarPlay to optional elements that you can avoid using. Android Auto still makes sense since it integrates most instant messaging services, the Google Assistant and Google Maps within its ecosystem, and that makes it easy for you to access important messages on the move, if you must. Apple CarPlay, however, provides no navigation service in India so far, and has only recently included support for WhatsApp. 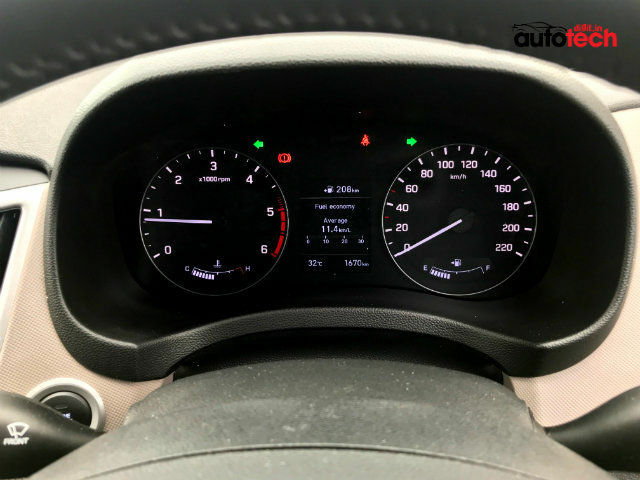 In the instrument cluster, while the backlit LED behind the analogue dials look decent, this particular layout is starting to look a little aged, and we hope that by the time the next generation comes by, instrument clusters in India will start becoming digital. 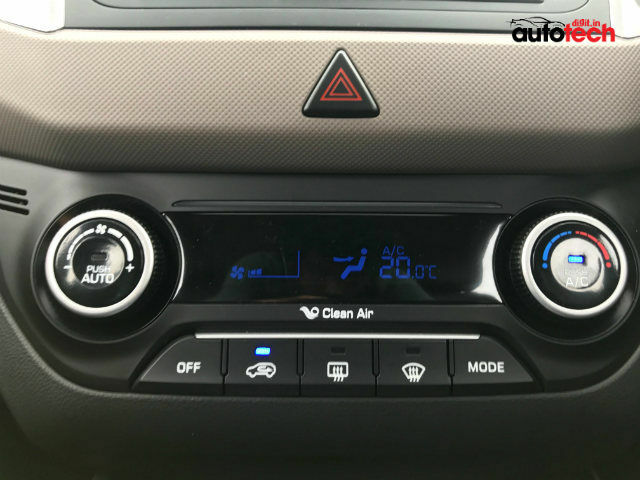 The centrally-placed multi-information display panel shows the standard tripmeter, odometer, alerts and notifications, but somehow doesn’t let you access call lists and recently played tracks, like in the Verna and Elantra. The panel is also monochrome, which may make it seem a bit dull on overall terms. 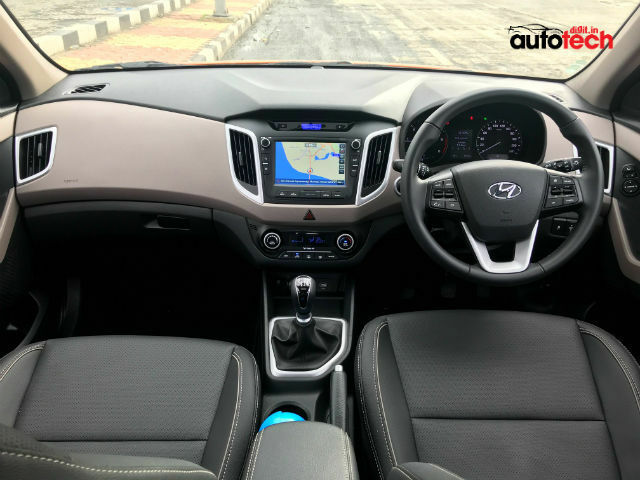 In terms of ports, the Creta includes the usual range of input sources, including two USB ports, an SD card slot (which houses the navigation maps), an aux port, Bluetooth and wireless charging for compatible smartphones. 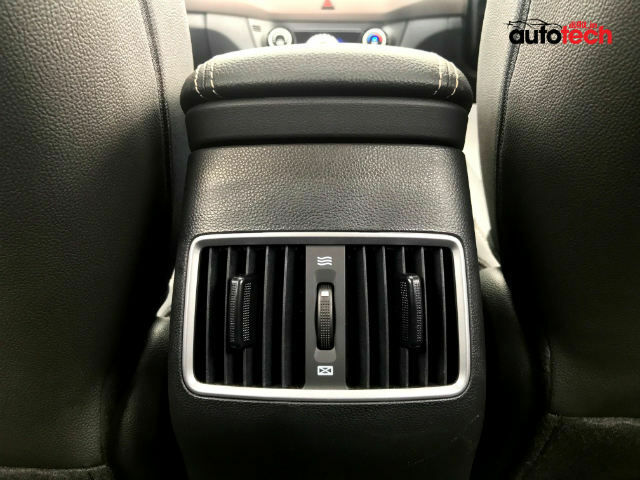 For other electronics, the Creta does not get the cooled seats like the Verna and Elantra, but the ORVMs are auto-folding. There are no automatic headlamps either, although these are ancillary features that you do not really miss unless you are really used to driving cars that have these features. The driver’s seat gets six-way electronic seat adjusters and an auto-winding window, while the front passenger seat has manual adjusters, while the rest of the windows are manually-operable electronic ones. This new Creta also gets a sunroof, an increasingly popular choice even though India is not the strictly ideal country for top-down summertime cruising. Talking of cruising, the 2018 Hyundai Creta now has cruise control, which coupled with the sunroof, the Arkamys sound mode and fairly impressive noise refinement, makes it a very enjoyable highway cruiser. Hyundai has put emphasis on making the Creta an easier car to live with, adding small but important features like the auto-dimming day/night IRVM, which really helps bespectacled individuals. The pick of the pack, though, is the Hyundai H-Band. A smart band very similar to the prototype that Tata showed with the Nexon, it is essentially a replacement for the key fob. 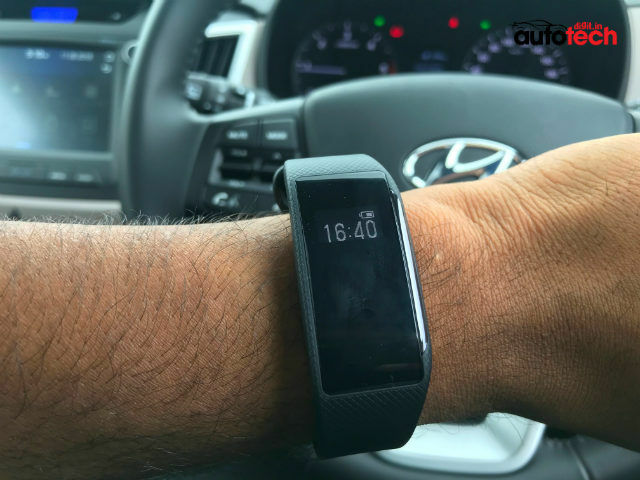 The Hyundai smart band looks almost identical to the Fitbit Charge lineup of smart fitness bands, and charges via the provided proprietary adapter. The range of functions that you can carry out with the Hyundai H-Band include locking/unlocking, tailgate opening, engine start/stop, time display, vibration-based alarm and call alert, and in combination with a smartphone app called H-Band (available on Android and iOS), even record sleep cycles, show total/average calories burnt, steps taken and distance travelled. 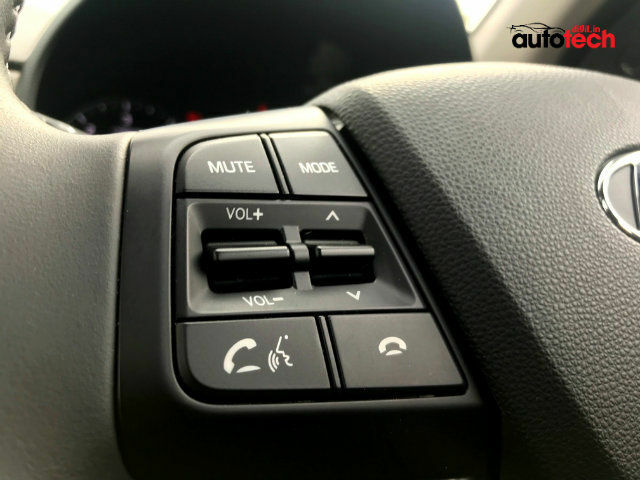 It is this that is the stand-out element of the Hyundai Creta’s technology package. 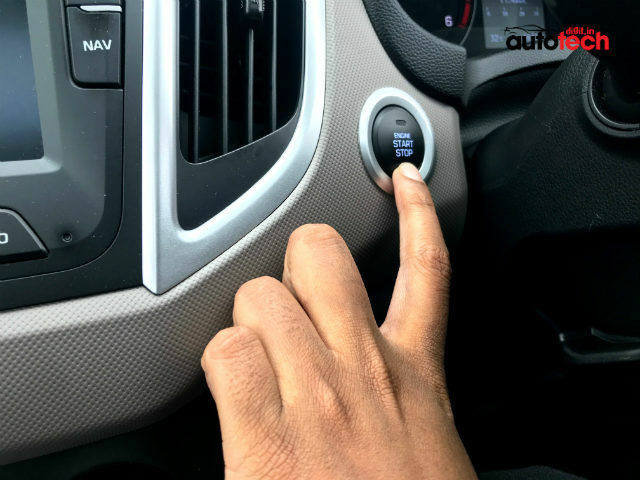 While it isn’t the natural course of action, I did get used to it fairly early, and once I did, it was really evident how such bands and other keyless options will be the way forward. While the Hyundai H-Band doesn’t look particularly impressive, it is functional, and I actually left behind my wristwatch out of sheer convenience. That said, it still needs improving in terms of overall quality of build and reliability of showing time. After one full week, the H-Band still had 25 percent charge left, so battery life and frequent charging should be of no great inconvenience. As mentioned before, the Creta has remained largely unchanged in this facelift. 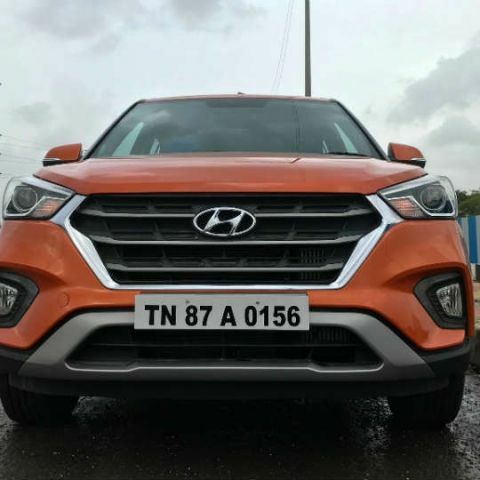 Hyundai recognised that even after nearly three years of being in the market, the Creta is still popular among SUV buyers, and felt no need to alter that. They did, however, tweak around a few things to make the facelifted Creta worthy of being called a ‘facelift’. Let’s begin with the exteriors. There’s literally no difference on the side profile - the silhouette is exactly as the previous Creta. That, though, is a good thing, since the Creta already had a very proportionate design. It is an interesting offset from the rest of Hyundai’s cars in India (Grand i10, Verna, Tucson, Elantra) in terms of the design language - while the other cars follow distinct curves and smooth-flowing lines, the Creta has a slightly boxier approach, although even that has more gentle slopes and an elegant overall design. The more chrome-infused front grille now looks bolder and more refined, and has been made bigger to give the car a more imposing nose. It still isn’t imposing per se, but certainly looks better. The slightly larger wheels with new, diamond-cut alloys look smart and suave, but aren’t particularly groundbreaking. The new front grille looks impressive, but you will need to look closely to notice the change. It is bigger, broader and has better presence, making the Creta look more ‘SUV-like’. 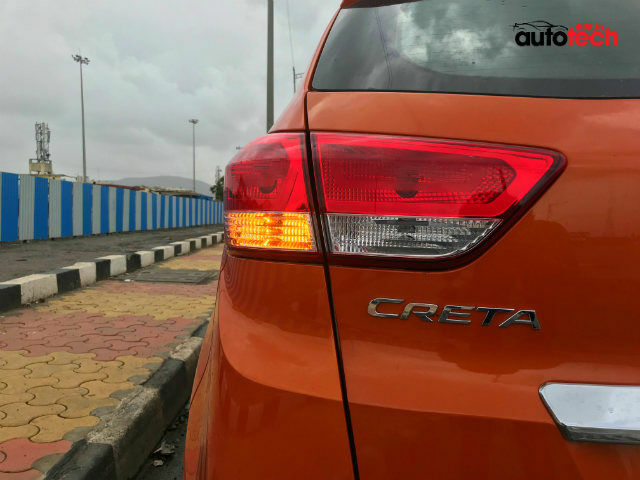 The alterations to the front and rear bumpers, too, have a likewise impact on the overall design – nothing too remarkable, but definitely an aesthetic impact that makes the Creta more of an SUV. On the inside, the overall layout of the dash is the same as the pre-facelift version. The notable upgrades here include a cruise control button on the steering wheel, electrically-adjustable driver’s seat, a small dustbin with a blue cap on top, and the sunroof. The entire layout, including that of all the controls and the central touchscreen are ergonomic, and we didn’t really have much to complain about. The overall quality of plastics is decent, albeit a bit hard and scratchy in certain places. What we really like about the Creta is its roomy, airy cabin, thanks to the large windows and now the sunroof. The all-black interiors in combination with the grey accents, however, do make things look slightly dull. The overall design and layout is also quite smart, and to sum it up, the 2018 Hyundai Creta largely continues with the same design, quality and ergonomics as the one before, while making small additions. These small additions may not spell magic, but they do refine the car by a margin. I personally feel that Hyundai could have done much more with the Creta, and this facelift feels a bit too similar to the outgoing one. This works against the Creta, but only when you compare it with the older one. 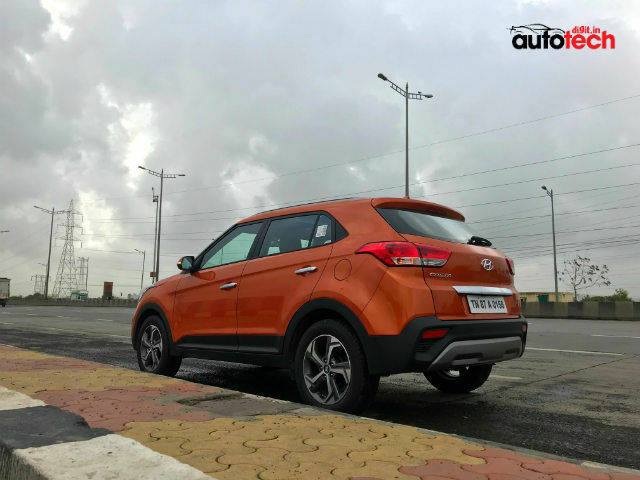 Evaluate it on standalone terms, and the 2018 Hyundai Creta has all the bells and whistles that you would want, need and expect from a car of its stature. 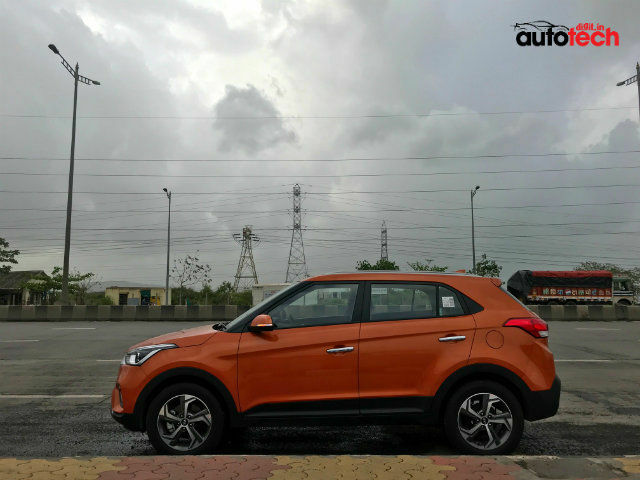 Before we get down to analysing the drive and ride quality, here’s a bit of a strange product decision by Hyundai – if you want the top-trim Hyundai Creta with the dual-tone interior and the sunroof, you cannot have it with an automatic gearbox. I’m not entirely sure how that makes solid sense, since I personally love having an automatic car to drive when out in the city, and a sunroof as an option when I’m out for a cruise down the Pune intercity highway on bright days. It’s not a major, major deterrent, but many may frown upon this decision. Nevertheless, we ditched the automatic gearbox in favour of having all the gizmos with us in the Creta. This variant we drove was powered by a 1.6-litre, four-cylinder diesel engine that produces 126 bhp and 260 Nm torque, and is paired with a six-speed manual gearbox. This is the same engine that we drove and liked in the Verna, and the characteristics of it remain the same in the Creta as well. There is a bit of lag in the initial revs, but as you go beyond 1500 rpm and the car picks up pace, the engine evens out to deliver linear power. What this translates into is smooth acceleration, and a refined drive that allows you to go about the city without any fuss, and cruise down highways at good speeds. The levels of noise, vibration and harshness are well-refined, and the Creta feels like a solid, stable car at any speed. I particularly love how easy it is to handle, although the steering wheel could have done with a bit more feedback. As for the ride quality, the Creta does get a bit surprisingly unsettled. Apart from this, the ride is fairly pliant, albeit a bit stiff. Still, rear seating for three worked perfectly fine, and while beige interiors may have worked better to brighten it up, I didn’t find myself complaining much through the horrid Mumbai roads. That alone makes the Creta a winner. Can the internal dvd drive of a laptop be replaced with a internal hdd? ?